Crossing the border from India north into Nepal, a traveler moves both forward and backward in time. Forward, because Nepali standard time is precisely 15 minutes ahead of Indian. Backward, because a glance at the calendar on the wall at Immigration shows it is no longer 2006, but 1126 Nepali Sambat. The date is not Aug. 29, but 13 Bhadra. Despite Nepal's recent identification as a newly secular nation, traditional Hindu and Newari calendars are still very much in popular use here. The Nepali year -- for Hindus, Buddhists, Muslims and animists -- is still governed by an ancient cycle of holidays and observances, tied to the agricultural seasons and lunar calendar. 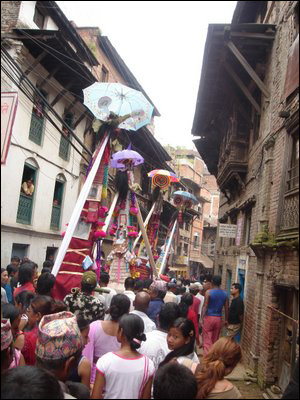 The holiday of Gai Jatra ("Cow Pilgrimage")is a sort of Nepali version of the Mexican Dia de los Muertos, or Day of the Dead. Each family who has lost a member during the previous year constructs a "gai" of bamboo branches, cloth, paper decorations and portraits of the deceased. The belief is that a cow must lead the dead spirits into the next land. 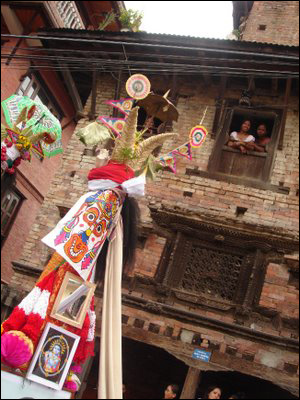 In Kathmandu city, families dress their small children as "cows" with straw horns and elaborate paper decorations, sometimes leading a real cow in a procession that, according to custom, must pass before the window of the old Royal Palace. In the traditional city of Bhaktapur, it's rare to see a real cow involved. Instead, bereaved families construct the "thaha macha" or "false cow." Each thaha macha looms overhead like a swaying radio tower. The bamboo tower is often covered with clothes that belonged to the deceased -- black for women, white for males; bright paper and tinsel decor, the straw "horns," and photos of the relatives who've passed that year. Photographs of the dead are carried on poles. The looming, swaying photos paraded unblinking through the streets reminded me of the Monty Python line - "bring out your dead!!" A line of poles disappear into the distance. Family members (usually males, but sometimes women as well) cart this contraption through the narrow streets on their shoulders. It takes at least four persons to maneuver the thaha macha, and the modern intrusion of telephone wires overhead requires special finesse. We took a local bus from Ratna Park (the central bus stand in Kathmandu) out to Bhaktapur. The one-hour ride costs 20Rs or fifty cents. In classic Asian fashion we sat on the covered gear-shift to give a proper seat to a local breast-feeding mom, who was as surprised as she was grateful. 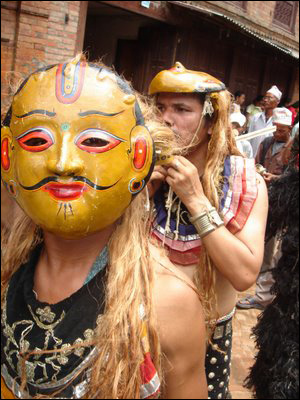 Gai Jatra is also a day for transvestism, political satire, free speech, playful stick-dancing in the streets, general goofiness and masking. Masked men dance myth into life. We saw street theater mocking the current Nepali political situation, as well as the North Korean nuclear standoff. In a sort of combination of April Fool's and Hallowe'en, "mad" comic papers of crazy news and political spoofs are printed. It was a long, hot sweaty day in the streets, but so much fun we didn't realize how dehydrated we were till it was long over. Fortunately, there are a number of lovely guest houses to accomodate the exhausted visiting Jatri. For kids, it's turned into a sort of all-purpose Halloween type holiday and I saw many plastic western-style masks. Spiderman is especially popular with both little boys and girls. 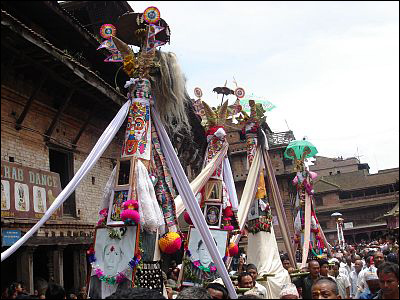 All the guide books describe Gai Jatra as a one-day event. 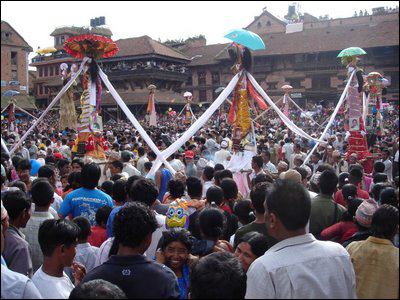 In Bhaktapur (literally, "city of devotion"), however, it's the beginning of a week-long festival. Every day sees different processions, with various street dances and costumes, till the final day of Krishna Janmashtami (Krishna's birthday). The story is that a queen of long ago, wife of 17th-century monarch Pratap Malla, lost her favorite son. She was inconsolable in her grief. Finally the king designed this festival to show her that others had felt the same losses during the year -- to illustrate that she was not alone in her suffering. The town makes a light-hearted celebration for their lost loved ones, which helps everyone complete the mourning stage. 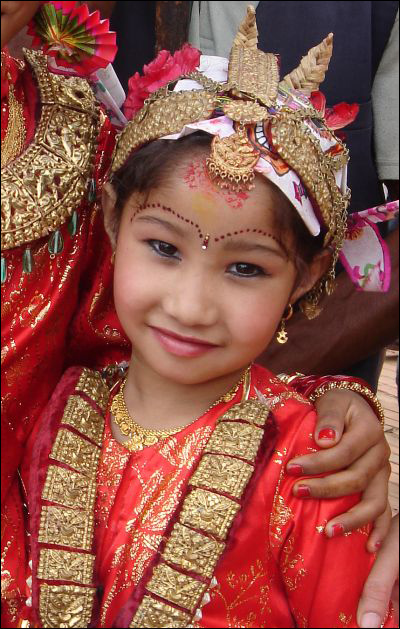 Every generation has a role to play in Gai Jatra. Even if you did not lose a member of your family, you are expected to help your friends and neighbors get all the Sacred Stuff together, which reinforces community bonds. Elderly men carry brass jugs of water to distribute to thirsty paraders, and older women, clad in their traditional black and red "pataasi" saris, stand at corners offering specially prepared ritual food on plates made of dried leaves. In late afternoon, having paraded their dead relatives all over town for a final look-see, the Cow Towers end up at the ancient Nyatapola Square. Beneath towering pagoda temples, they assemble in a moving circle, resembling a massive MayDay dance. The procession is led by what looks like a towering haystack. This represents Bhairav, the wrathful protector god of Nepal, who will lead the dead to their resting place. Traditional pipes, drums, cymbals and flutes chime in hypnotizing rhythms as the faces of Bhaktapur's dead do one final dance. At the parade's end, well after dark, the False Cows are taken to the edge of the river and hacked apart with hand-axes. All the disposable parts -- bamboo, paper cow-face decor, tinsel and straw -- are tossed in the water, which ripples under the silvery full moon. If you missed it, don't worry. 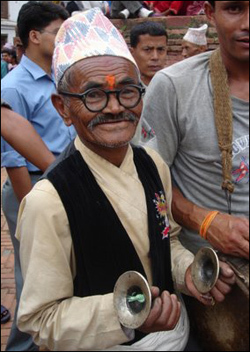 In Nepal, we live with one foot in the modern world, one in the mythical past. There's always another festival next week. Young girl ritually adorned as a "cow" for the day.